Let’s move away from Samsung, LG and other major manufacturers for a bit, shall we? There are models out there we hardly ever notice. These models are giants in their own way, albeit secluded by the shadow of the brands that have been on the market for decades. Being less known does not at all mean being of lesser quality, and Polariod 50GSR3000FA is one of the best examples of this statement. In fact, serious less known brands are known to push out high quality models into the market on regular basis as they can’t really compromise on quality. One single slip can cost them dearly. The design of the Polaroid 50GSR3000FA is nothing impressive. While its far from ugly, it simply doesn’t make the user admire the TV while turned off. Seems that the company has followed successful design patterns of familiar giants, and they did a good job. The slim frame design makes the 50“ screen the focal point, rather than the frame grabbing attention away from the screen. The frame itself looks really nice when mounted on a wall, seamlessly blending into the room without disturbing the rest of the space. 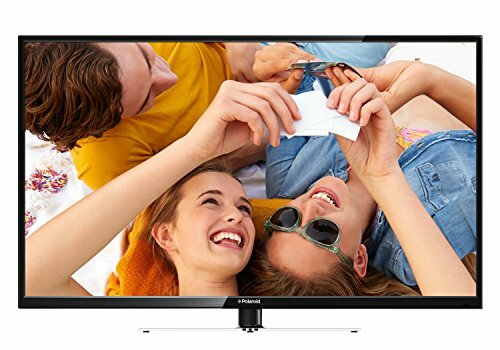 This Full HD (1080p) TV provides the viewer with superb viewing experience. The picture is clear and crisp, without much motion blur while the colors are very vibrant. In short, everything looks very natural and doesn’t strain the eyes like some models do. However, if „hotter“ or „colder“ colors are preferred, the user is given the ability to set everything up according to their preference via an intuitive interface of the 50GSR3000FA. Considering different audiences, this particular model will cater to those looking for movie entertainment, sports, talk shows, as well as for gamers. It is a good time to buy a Full HD TV rather than a 4K one, as the lack of content in 4K will allow us to enjoy Full HD for another few years. Polariod 50GSR3000FA’s 60 Hz refresh rate might be on the lower end for playing video games as higher refresh rates are usually preferred. However, the lack of higher refresh rate is compensated by low input lag and motion blur. The Polariod 50GSR3000FA costs several hundred dollars less than other 50 inchers made by renowned TV manufacturers. This makes the TV a good investment as the user is getting everything they’d usually get for a much lower price. The model goes for around $600, give or take, at most resellers. The lack of Smart functionality, which became a standard today, doesn’t do it any favors though. Certain features that the users might have gotten used to are not available on this model. This being one of the major disadvantages of the TV, it has to be mentioned that despite this, the 50GSR3000FA can be turned into a smart TV by adding an Amazon Fire Stick, Chromecast, or some other device. Not only will it turn the TV into a Smart TV, but the user will be granted access to heaps of premium quality content, something that doesn’t come with a „standard“ Smart TV. The TV is equipped with two 8W speakers that provide a clear sound at decent levels. The bass is a bit low, so if the TV is intended to play music, a set of speakers might be required to enhance the overall quality.